Do you remember your first home? No matter how big or small, old or new it was, the memories of your first home will likely be treasured forever. So imagine if you had an opportunity to make the dream of a home a reality for someone and you were invited to the house warming party! Today, I’d like to share an inspiring story of how Tyler Dillon from Butterfield & Robinson is making this possible. Out of all the places I have worked and lived, Myanmar takes the cake. For a number of years I have been travelling, living, and working abroad–in search of what, I couldn’t say. Possibly a further understanding of the world, new perspectives, a sense of adventure. Or maybe it’s just because I cannot sit still and life on the road is one of constant activity. Through all of these travels there is one place in particular that has stood out, and I think always will stand out: Inle Lake and the mountains of the Shan State in Myanmar (Burma). After time spent in lands as diverse and majestic as New Zealand, Ireland, Peru, China, Patagonia and even my home in the American south, after all this, I found Inle Lake had a touch of magic unlike any other. Being there feels like being in a Roald Dahl story: a constant mixture of strangeness and wonder. 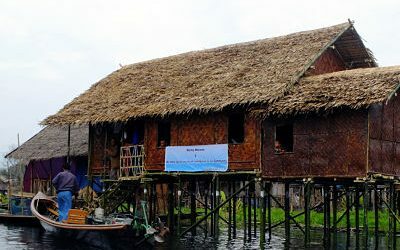 In the autumn of 2010, while researching biking and hiking routes in Inle, I discovered that to build a house for a Burmese family cost just US$800. Since it was November and the holiday season was approaching, I decided that, in lieu of Christmas gifts, I was going to build a house in the name of all the folks I would normally have bought presents for. Then I realized they might want to contribute as well, so I began emailing friends and family to explain the project and ask for donations. I quickly started adding more people to the email list, given the cost of the houses and the immediacy of the need, which I could see easily being there on the ground. Emails were sent and things started to grow. In discussions with folks in Butterfield & Robinson’s main Toronto office, a fundraising challenge was made that stipulated that B&R would match the amount I raised. The pot grew (and grew and grew) and by the end of December we had raised upwards of $20,000. “There is a kindness to the people that is rare in this day and age and it has stolen my heart,” I wrote to my friends and family. I must admit, it was a surprise, and a bit overwhelming, so we called upon the help of some old friends we had worked with before in South East Asia doing NGO work, the Global Community Service Foundation. With their help, we quickly set up some criteria for selecting families in need, and we hired people on the ground who live in the area year-round to manage and continue to check up on the families we chose. Today, every group of people that travels in Myanmar with B&R will meet a family and help them move in for their first day in a new home, and a new life. Neighbors come along with monks to bless the house, and of course, we come and hold a grand party, complete with dancing and music. I must admit, I cry every time. It is a beautiful thing that people have the ability to do for each other; it is us being human in the best possible way. After the first year of houses, Butterfield & Robinson decided to fund a house for every group that goes through Myanmar with the company. Now we have built about 50 houses in various regions around the lake. What the future holds for the program is hard to say; when giving and help one needs to be flexible, and the needs of a community change, so we must be prepared to change with it. Perhaps our future efforts will focus on water treatment, or prenatal care, or any number of things in need of attention in the developing world. But one thing we know for sure is this: now that we’ve gotten a taste of how we can help, we’re thirsty for more. In the next year we will be starting a similar program in Cambodia, in another wonderfully magical region in need, which is also a wonderful place to visit. We are looking at doing a project for folks who honeymoon there, as a way to offer young couples starting their lives together a chance to provide opportunity for a family in need.